You are visiting the SAR-Norway section website. To return to the global Scholars at Risk’s website, click here. Showing all News for SAR-Norway. 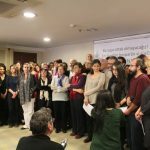 A coalition of 20 higher education networks and associations from around the world have issued a joint public letter expressing grave concern over recent reports of widespread pressures on members of Turkey’s higher education and research community.